how do i restart this thing? i had planned to take just a month off from blogging to travel with my partner in south africa for the entire month of august. 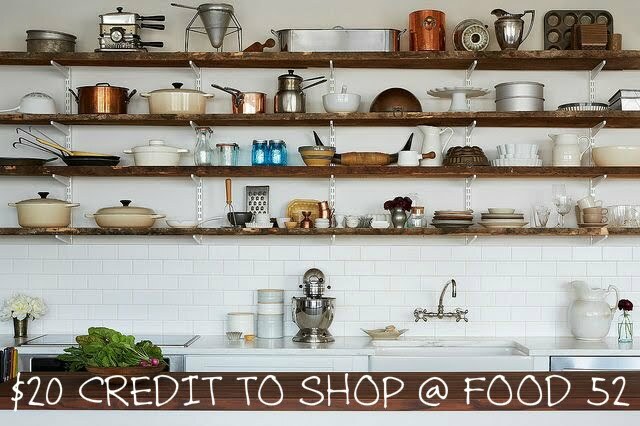 then from the moment we landed home, i had a long list of tasks to tackle... starting with laundry and then bigger tasks like marketing myself for more private chef clients to fill my schedule back up. i've been trying to hustle but struggling to shift gears out of vacation mode. i'm pretty certain my list of tasks has grown longer faster than i've been able to tick things off it. so my blog sat idle for not one but two months!!! but not for lack of inspiration. our trip to south south africa was incredible and i have memories and photographs that i'll cherish forever. rad bouldering, inspiring sunsets, new friends and wonderful time spent with my favorite person. we had some fantastic meals but the cuisine is very (like reeeeally) meat heavy. i was thrilled to be there during their citrus, passionfruit and avocado season, but i really craved vegetables. i failed miserably trying to find a farmers market with fresh produce beyond the same small selections at the grocery store. so i pitifully bought arugula in tiny plastic "fresh herb" packets because it was the only bitter greens i could find. i cooked a lot of rice and lentils, rice and beans, fried rice and ate avocado toast day and night. i kept dreaming about our markets back home and told a south african climber about the tomato farmer who grows probably 30 kinds of heirloom tomatoes. the south african was stunned! "we have two kinds here. big or small." i was so excited to get my hands on heirloom tomatoes and have been all giddy with all the produce coming into season. it gives me so much pleasure and inspiration... i just needed to get into gear again to share it with you all! i drew some inspiration for this fall salad from nigel slater's cookboook tender, for a pumpkin pangrattato. "grated bread" aka breadcrumbs. so first i experimented with homemade breadcrumbs. i think i'm partial to the bread crumb version, but got curious to try a crispy quiona version. both were spectacular. 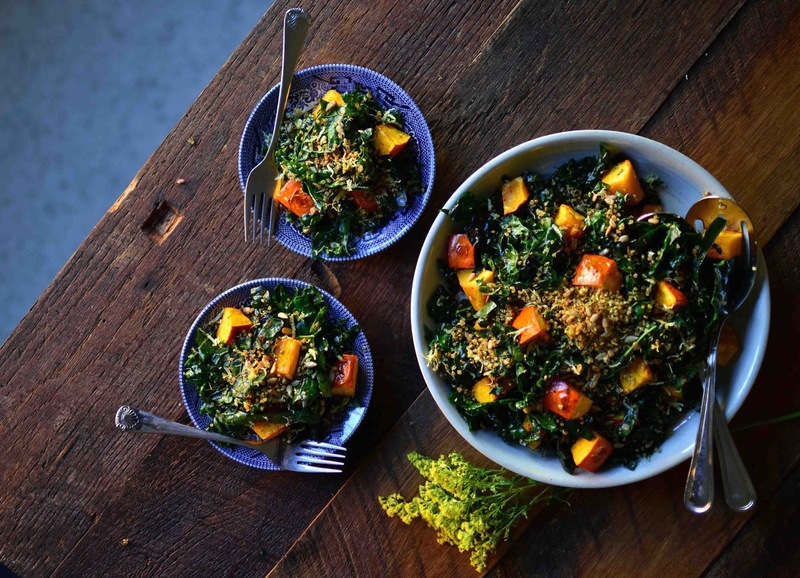 without the pangrattato, this is just a simple salad with some of my favorite seasonal flavors. but with the pangrattato... oh, you'll be glad you didn't skip it! 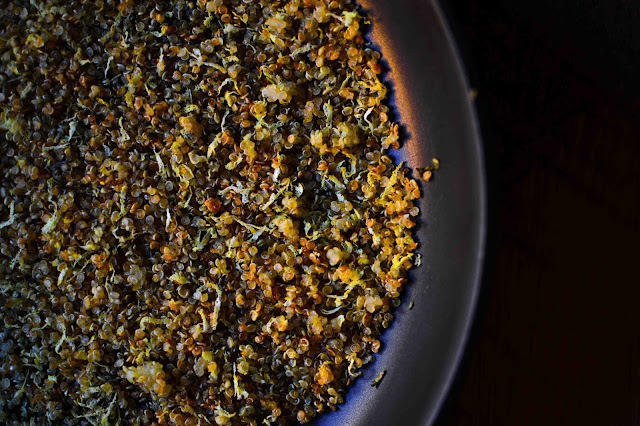 if you're curious to try this recipe with breadcrumbs (because it was stupendous!) 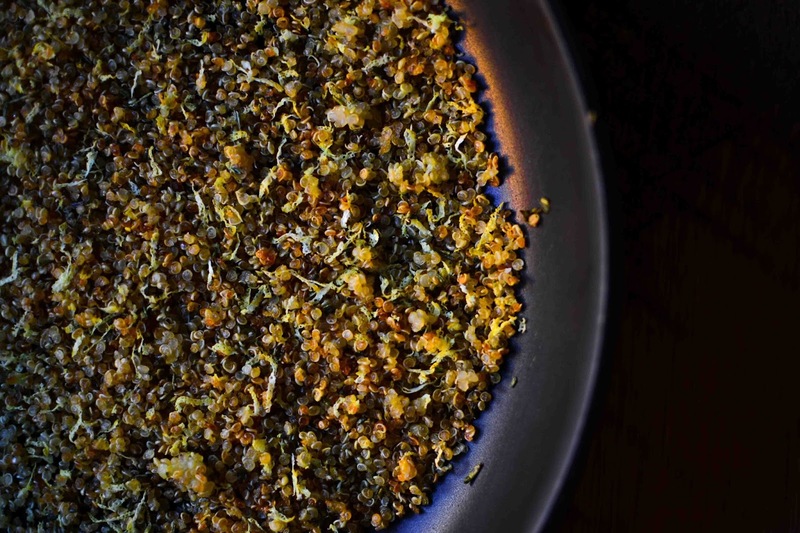 just swap a cup breadcrumbs (ideally chunky homemade breadcrumbs) for quinoa and add a bit more oil (or butter) ... they will brown quicker, but otherwise follow same recipe and directions! 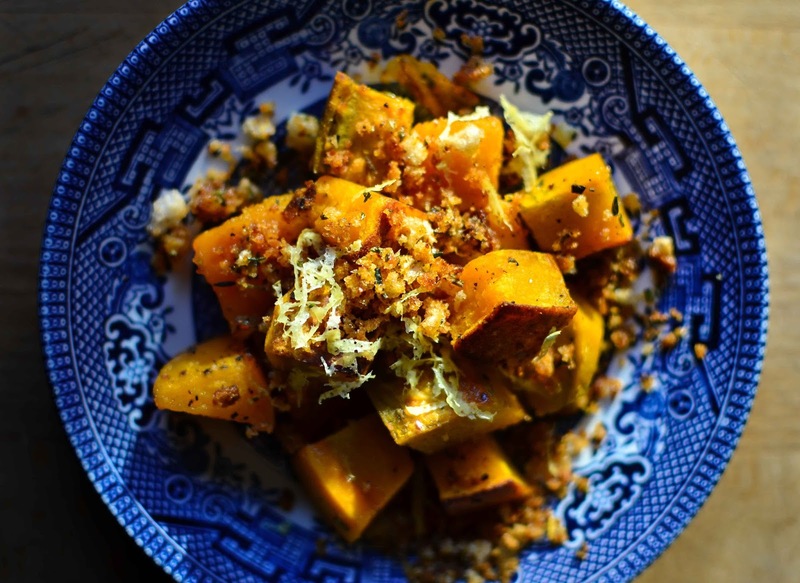 the pangrattato is a wonderful topper for roasted vegetables and squash! 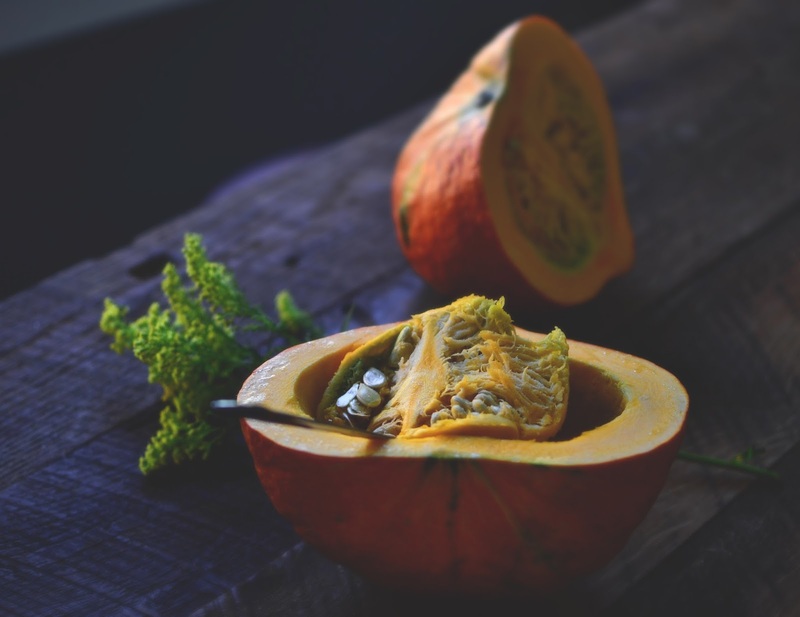 preheat oven to 375. gut squash and carefully cut into cubes slightly smaller than 1" - the beautiful thing about organic red kuri squash, is that you can and should eat the skin! 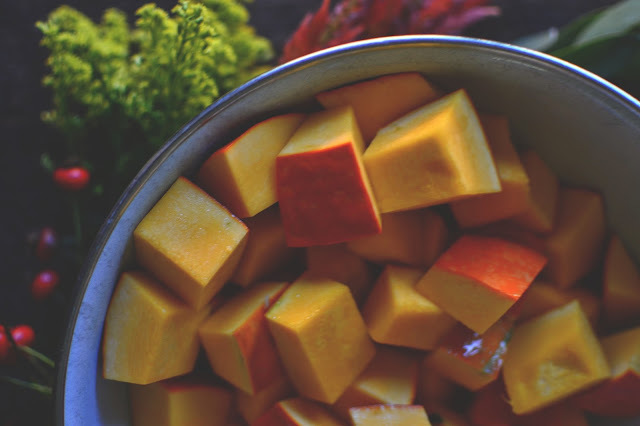 if you're using another squash variety, or if your particular kuri squash has a really tough skin you might prefer removing it with a vegetable peeler first, then cutting into cubes. toss cubed squash with olive oil, salt and aleppo pepper - reserving the maple syrup for later. line a baking sheet with parchment paper and spread squash out in a single layer. roast for 15 minutes and then stir to turn squash on their other sides. continue roasting until squash is fork tender, then remove from oven and drizzle with a tablespoon or more of pure maple syrup. if the quash seems a little dry, add a tiny drizzle more of olive oil too! stir to coat and return to oven for 5-10 more minutes to let sugars caramelize. in a skillet (nonstick is best), heat oil, quinoa, salt and red chili flakes over medium-low heat. don't rush it, you want the quinoa to brown slowly and crisp up rather than burn. stir every few minutes and continue frying until quinoa is toasted golden. add chopped rosemary, lemon zest and garlic and continue frying until gently browned - adding a bit more oil if quinoa is burning. de-stem, wash and dry kale and tear or chop into large bite size pieces. massage kale in a bowl with lemon juice, olive oil and maple syrup - you can start with less and add more to taste. 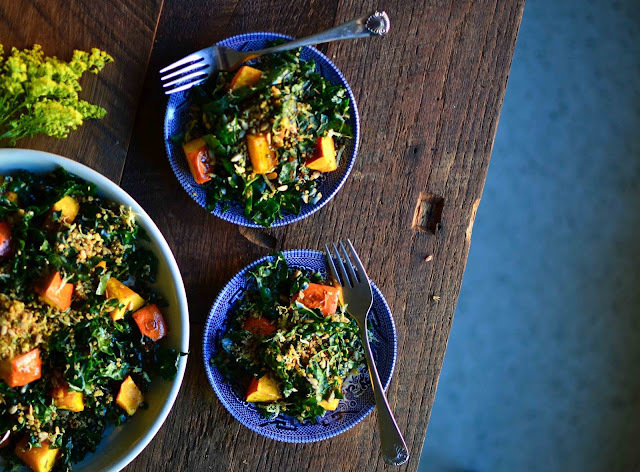 season well and toss with roasted seeds, warm roasted kuri squash and crispy quinoa pangrattato. top with a little extra lemon zest and a drizzle of olive oil!